Americans love miniature horses. Southwest Airlines allows them onboard commercial flights as emotional support animals. Pigs, ferrets, spiders, peacocks and hedgehogs are on the no-fly list. But L’il Sebastian made the cut. Alligators did not – which is good because gators and miniature horses don’t mix, not unless the reptile is hungry. 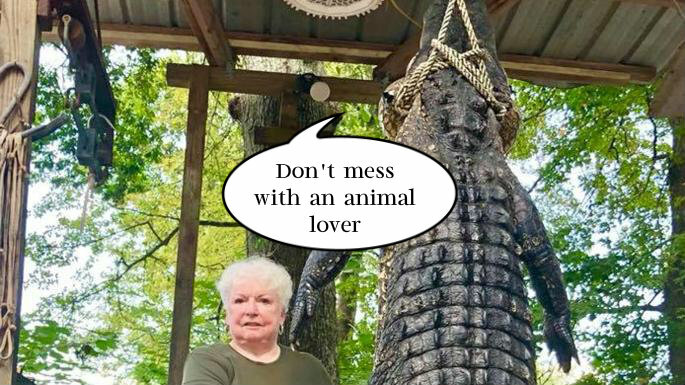 To Texas, then, where an 11ft alligator devoured a little horse owned by Judy Cochran, 73, mayor of the rural town of Livingston. She caught the killer and shot it dead. For 20 days a year alligator hunting is permitted on public land in Livingstone and greater Polk County. The only rule is that alligators must be caught first before they can be killed. Ms Cochran’s son-in-law, Scott Hughes, tempted the horse-eating gator with a dead raccoon he found by a roadside and “seasoned”. The bait was laced with a large hook and tied to a line over a lake. When the alligator took the meal, Cochran despatched it with a single shot from her Winchester .22 Magnum. You’ve got feel sorry for the gator – if people bought normal sized horses, he’d have had no need for that racoon pudding.